I’ve been looking for a good convenient keto snack. One of the most difficult parts of being on the keto diet is satisfying that afternoon urge for something to pick at. Luckily this diet keeps those cravings to a minimum. Sometimes I just need something quick and easy after fasting or a small lunch though. I recently went and paid too much money to get a sampling of a lot of keto snacks on Amazon. This is my review for the FBOMB Fat Bomb Salted Chocolate Macadamia Nut Butter snack from Love You Foods. These little bad boys are made of pretty simple ingredients: Dry roasted macadamia nuts, organic dark chocolate, and sea salt. The dark chocolate is made of unsweetened chocolate, cane syrup, cocoa powder, cocoa butter, and vanilla. Obviously, this is not going to be a choice for someone with nut allergies with macadamia nuts being the number one ingredient. Beyond that, this is all natural ingredients. They are all paleo friendly and keto friendly. Yes, there is cane syrup, but that barely adds any sugar as you’ll see in the nutrition below. The Fat Bombs are about the size of an iPhone. The pictures on Amazon and their website are a little misleading, making it look like the packs are about to burst with the nut butter. They aren’t filled with air like a bag of Lay’s potato chips though. They don’t call this a fat bomb for nothing. 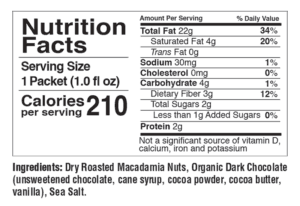 Each little packet contains 22 grams of fat including 4 saturated fats and 0 trans fat. This is sure to help you get a boost if you’re having issues adding enough fat to your diet on keto. In terms of carbohydrates, there is only 1 net carb per packet! There are 4 total carbs and 3 grams of fiber which makes this a little better than just downing some coconut oil or MCT oil for the sake of increasing fat intake. You also won’t spike your protein levels since there are 2 grams per pack. I think that this makes an excellent snack for bumping up fat without aggressively bringing up protein and barely adding to your total carbohydrate count. A nutrition powerhouse is still useless if it tastes like trash. Those of us who drank chalky protein powders in the 1990’s and early 2000’s know too much about that. Luckily, these are pretty good. I wouldn’t say that they are replacing the afternoon desserts that I was eating at work before. They do satisfy my sweet tooth though. To be honest, I barely tasted the salted chocolate in these. It really just tasted like an oily nut butter, which wasn’t a bad thing. There are a few other flavors offered that I’d like to try. There is also Macadamia with Coconut Nut Butter, Macadamia with Pecan Nut Butter, and Macadamia with Sea Salt Nut Butter. I’ll 100% buy more of these. It isn’t exactly like a daily bag of chips replacement. They are kind of pricey at about $2.50 per pack. This is something I’ll keep around for when I need a snack and not for when I just feel the urge to taste some food. They are super convenient so I have them stashed all around. There is one in my gym bag. A few of them are in my desk drawer at work. I put one in my car. I’m curious about how the heat will affect that one in the hot Los Angeles summer. I’m also excited about how easy it is to make these snacks for hiking or travel snacks for when I’m backpacking. Does it make you feel full? I’m writing this about an hour after eating one. I was pretty hungry due to a small lunch, but now I’m feeling pretty good. It is one of those snacks that you have to give a few minutes before your body realizes it’s full since it’s so small. I often find it difficult to hit my fat goals every day, so this is helpful in getting there with a healthy food. Love You Foods is run by husband and wife team Ross and Kara. The company is based out of Flagstaff, Arizona. Ross and Kara are strong supporters of the low-carb / high fat diet. They saw realized that while it was easy to find easy snacks for extra protein or vegetables, convenient fat snacks were harder to find. 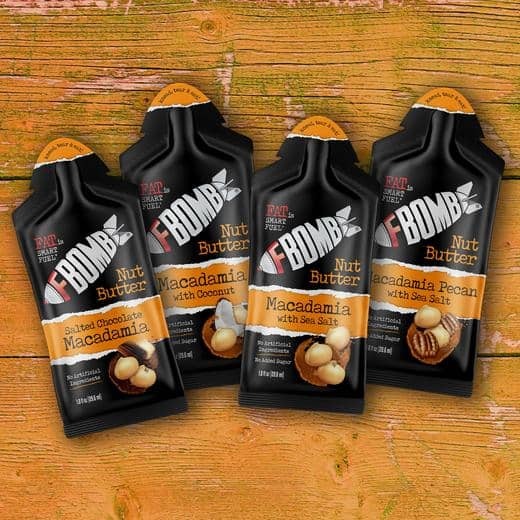 They created the FBOMB brand to satisfy this need for themselves and others looking for a quick high-quality fat snack.